A coffee cake is basically a small cake that's served with coffee or tea and usually consumed at breakfast or during a break in the day. Because it is typically paired with a strong beverage, coffee cakes usually have strong flavors - typically with a nutty or fruity theme. Often, coffee cakes bought at coffee shops are dense and rich (sometimes almost oily) beyond belief. Here is an updated version of my favorite recipe for pecan coffee cake that is both rich in flavor yet light and fluffy in texture. After experimenting with adding ground almonds to Chinese Almond Cookies and reading about grinding roasted pecans into Cook's Country's version of Pecan Coffee Cake (which I found surprising because it's a Bundt cake, which they claim is traditional - even though I've never seen a coffee cake sold or presented in the shape of a Bundt - still, could be true...), I thought I should add some ground pecans (essentially a "pecan flour") to the batter of my recipe. 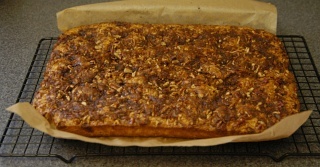 I had previously used the pecan streusel topping to provide the pecan punch - which, although simple, worked rather well. It probably helped that this coffee cake isn't particularly tall (thus the ratio between streusel and cake was not overwhelmingly in the favor of the cake and you were practically guaranteed streusel in every bite). 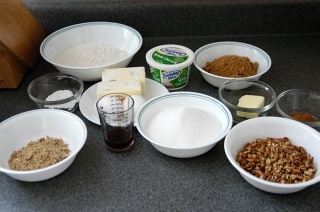 However, adding the ground pecans to the batter turned a good recipe into a great recipe. 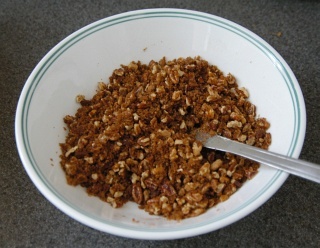 Start off by toasting 1-1/4 cup (135 g) chopped pecans. Do this by spreading them out on a sheet pan and baking in the oven as it preheats, about ten minutes. (Preheat the oven to 350°F or 175°C.) Once the pecans are fragrant, take them out of the oven. Keeping them in the oven too long will result in slight burning which will leave an acrid flavor to everything - so avoid this at all costs. Use a spice grinder or a food processor to finely process 1/4-cup of the roasted pecans (about 25-30 g). Use a succession of quick pulses because too much processing will result in a paste. About ten pulses from my spice grinder provided adequate results. Reserve the rest of the roasted pecans for the streusel. As usual, assemble your ingredients before beginning. 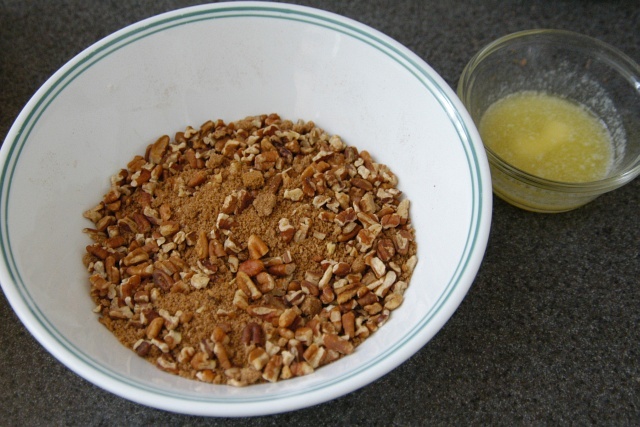 For the dry ingredients, use 1/4-cup (25-30 g) roasted pecans, finely ground, 1 Tbs. baking powder, 1/4 tsp. salt, and 2 cups (250 g) sifted all-purpose flour. 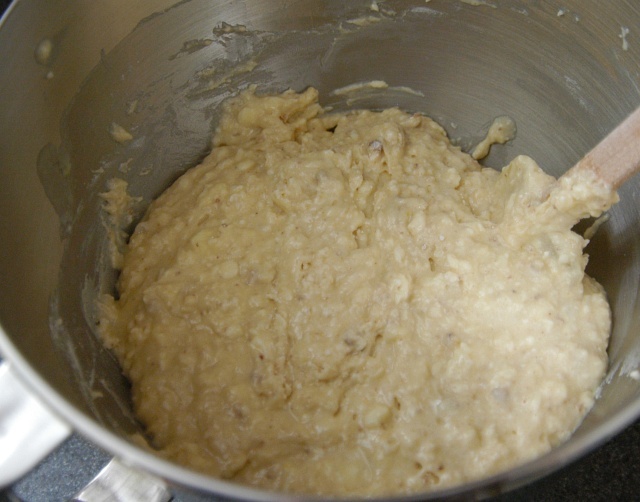 For the "wet" ingredients, gather up 1 cup (225 g) butter, softened, 2 large eggs, 1 Tbs. 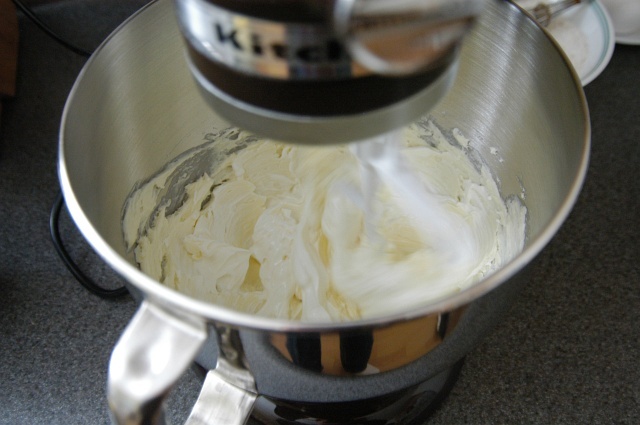 vanilla extract, 1 cup (230 g) sour cream, and 1-1/2 (300 g) sugar. For the streusel, prepare 1/2 cup (110 g) brown sugar, 2 Tbs. butter, 1 tsp. 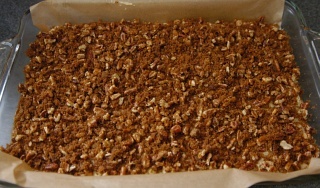 ground cinnamon, and 1 cup (110 g) roasted pecans, chopped. Whisk the flour, baking powder, and finely processed pecans together. 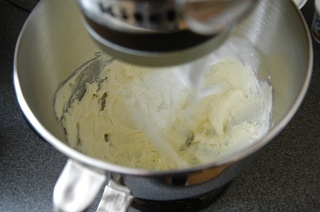 Cream the butter and sugar together in a mixer until smooth (about 30 seconds at medium low speed). 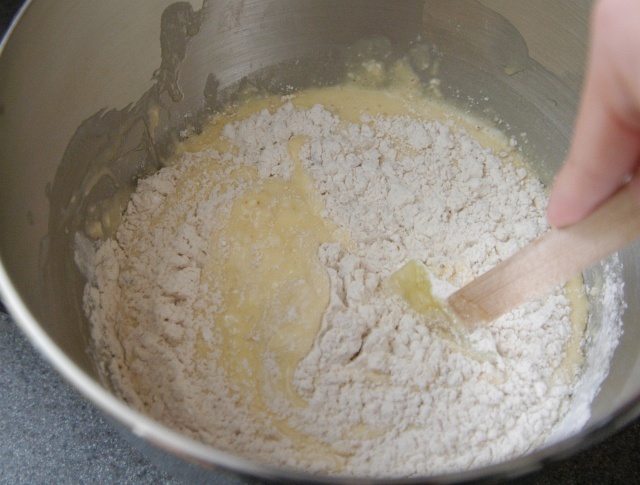 Using softened butter, will reduce the tendency for the butter to stick to the sides of the mixing bowl (and thus reducing the need to scrape down the bowl). Scrape down the sides of the mixing bowl. Add the sour cream to the mixture and beat until combined. Scrape down the bowl again, if needed. At low speed, mix in one egg at a time. Mix in the vanilla extract. Remove the mixing bowl from the mixer and add the flour mixture to the contents. Using a spatula, fold the solids into the batter. The resulting mixture may have a few lumps. Don't worry about these - they'll cook out as you bake the cake. Prepare a 9x13-in. baking pan by greasing the bottom and sides with a little butter. To make extraction and cutting easier, I like to line the inside with a sheet of parchment paper that hangs out over the sides. The extra paper will act as handles later when I pull the cake out of the pan. Press the paper to the pan so it is as flush as possible (wrinkles in the paper will result in wrinkles in your coffee cake). Pour the batter into the baking pan and level with a spatula. 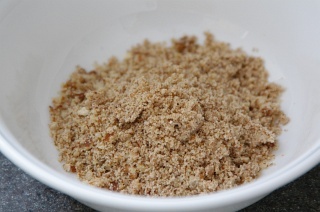 For the streusel topping, melt two tablespoons butter in the microwave (about 10-15 seconds). Meanwhile, combine the remaining pecans with the brown sugar and cinnamon. 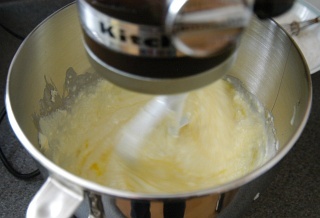 If the butter hasn't completely melted, swirl the melted butter around the unmelted piece until it has completely melted. (If this doesn't work, microwave for a few more seconds.) Pour the butter into the sugar/pecan/cinnamon mix. Mix together until it becomes a uniformly darker color. Sprinkle the streusel evenly over the batter. I find this is easiest accomplished with my fingers. Using a spoon almost always results in uneven coverage and large random clumps which need to be redistributed later. Bake the coffee cake on the middle rack of the oven for 35 minutes at 350°F (175°C). A toothpick inserted into the middle of the cake should come out clean (no wetness, perhaps a dry crumb or two). At this point remove the cake from the oven and let the cake cool in the pan for about 10 minutes. Remove the cake from the pan and set onto a wire rack to fully cool. This is easily done if you made the parchment paper sling. I actually don't know how long it takes to cool the cake because I've never been able to wait long enough - I always cut into it too early because I'm too eager to eat a piece. Once the cake has been completely cooled (or you can't wait any longer), transfer to a cutting board and cut into reasonable sizes. 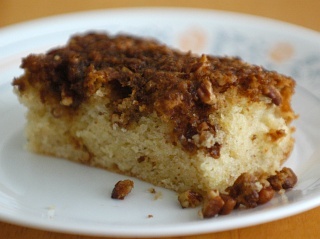 Coffee cake is pretty rich and is generally consumed with coffee or tea as a snack or a brief respite from the daily grind, so too large of a piece seems to not fit its purpose for existance. (Anyway, you can always grab a second piece...) I cut them into sixteen pieces of approximately 2-in. by 3-in. dimensions. These are fairly sizable, so you may wish to make smaller pieces. Batter pour into 9x13-in. pan top bake 350°F (175°C) 35 min. Summary #2: Dry ingredients listed first - broken in Firefox! In Internet Explorer, they both render as expected - but in Firefox, Summary #2 makes it look like the eggs don't get mixed in at the proper step. Using the DOM Inspector shows that the horizontal line separating "mix in 1 at a time" doesn't belong where it is rendered! I tested this with Firefox 1.5.0.1 and Firefox 1.0 - both exhibit the same behavior. If I change the code so it does not perform a style="border-left:0px" and uses a style="border-left:1px solid red" the line miraculously disappears! Unfortunately, this isn't what I want. I'm pretty sure this is a Firefox bug. Anyone know how to submit a bug to Mozilla development? I looked really quick to see if there was a submission form, but didn't see it. I'll look again later when I have time. I would suggest clicking on the "Report Broken Web Site" link in the help menu of FF 1.5. In theory, a dev will get in contact with you and help you correct the problem. If you suspect a bug in the "Gecko" layout engine (aka "NGLayout"), then your best bet is to go to https://bugzilla.mozilla.org/ and see if the problem is already entered as a bug, or file a new bug report. great greasing instrument. 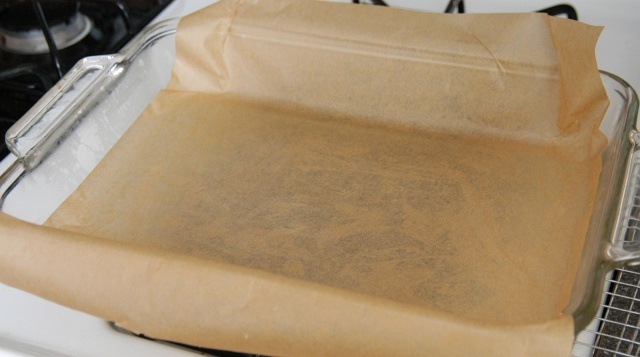 Use the paper wrapper on the pan to be greased, greasing sides and bottom of the pan. They can also be refridgerated until needed. As I was trying this recipe I came to the step where you add the sour cream. Thinking I had enough in the fridge I opened the container to see I had probably about a 1/3 C of sour cream. Not wishing to return to the store I used some heavy cream I had on hand to bulk it up to a little less than a cup (I didnt want it too liquidy). The result was very rich but not too overwhelming. I can't imagine that a coffee cake with a cup of butter, a cup of sour cream, and two large eggs should be called "light and fluffy." Obviously, it's not light and fluffy like angel food cake, but it is surprisingly light and fluffy in comparison to most coffee cakes. Trust me, you'll like it. Can I put everything together the nigth before and cook it in the morning? Subject: Great cake, duplicate recipe?? The cake is great. 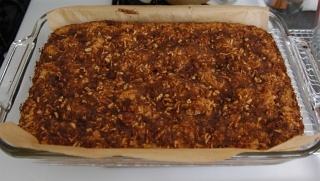 I'm a bit puzzled that there is recipe exactly the same on allrecipes.com: http://cake.allrecipes.com/az/mzingPcnCffCk.asp. Still, the cake is great. Subject: Re: Great cake, duplicate recipe?? I posted the message. I was puzzled because the recipe on allrecipes was posted first by quite a while, but yours contained the paragraph at the front that shows you created it yourself. That's all. The recipes really are virtually identical which is crazy, but I don't wish to imply that you copied it and took credit. Have you considered crossposting your recipes to allrecipes? That would be really useful for some cooks, and might get more traffic for your site. BTW the cake is just as delish' the day after. This sounded a lot like a quickbread my grandma made for me once, so I had to try. What she made was a box mix, actually, but I haven't seen the mix in stores ever since then. I've been looking for a recipe like this for quite some time! I prepared it basically the same, except I had no sour cream so I used 3/4 cup goat milk (its just what I have around, ok :)). I also left the crumbled pecans out of the batter. Instead of using a brownie pan though, I used a loaf pan. I poured half the batter in, sprinkled it with half the struesel, then repeated with the other half. It had to bake longer, about 50 minutes, but it was so worth it. 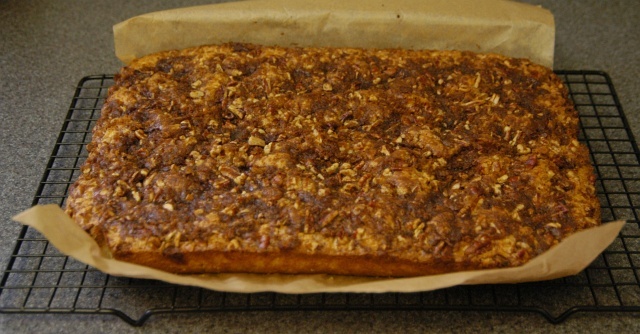 The cake is awesome, and now instead of letting my mouth water at the thought of pecan quickbread, I can make it! I used plain yogurt as a substitute for sour cream - still came out texture perfect with a little hint of sour. Rather than using yogurt if you run out of sour cream, just use half yogurt and half cream. If the yogurt is too sour don't use it at all. This was the first recipe from this website to give me trouble. The cake came out, well, too fluffy. The dough does not hold together, instead of being cut it basically fell apart left and right of my knife. 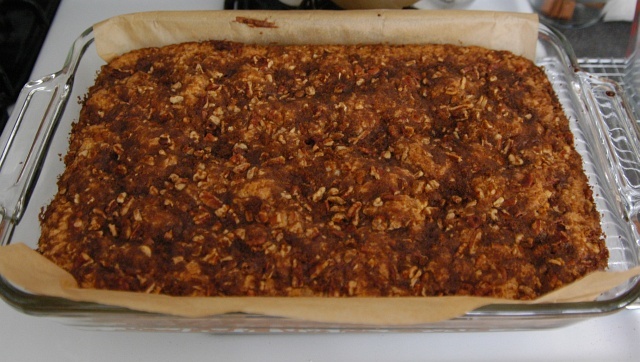 The dough is done, with just the hint of moisture left, and it tastes absolutely delicious, but it is more a baking pan full of crumbles than a solid cake. My only deviations from the recipe were probably [u:0eecf729ca]slightly[/u:0eecf729ca] higher amounts of sour cream and baking powder due to guesstimation of their volumes. What other factors could cause this? 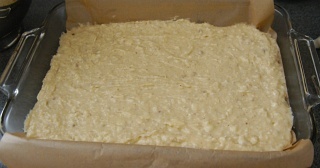 cake doughs need a bit of cooling for the structure to firm up. That might be the solution. After one night's rest the pieces I "cut" now have taken more or less solid shape and hold together. Thank you! Can I use a pan of mini muffin cups instead of the large rectangular pan? Absolutely, they wont dome like a more airy batter, but you can always bake things in smaller portions. Just make sure that the individual cups all have adequate ventilation to ensure consistent baking. If your not using paper, butter then flour. I've just spent an hour or so browsing the site and have come away with 3 solid recipes so far. The porterhouse steak, the english toffee and this. I think my sunday morning breakfast is going to include coffee cake!